An amazing study has found that acupuncture, the ancient practice of using needles to stimulate self-healing in the body, is more effective than intravenous morphine for acute pain relief. A truly groundbreaking study published in the American Journal of Emergency Medicine, titled “Acupuncture vs intravenous morphine in the management of acute pain in the ED”, reveals that acupuncture — one of the oldest techniques to treat pain — is more effective, faster in relieving pain, and with less adverse effects, than intravenous morphine. “The pain scale change from baseline at each time point in the 2 groups is shown in Figure. 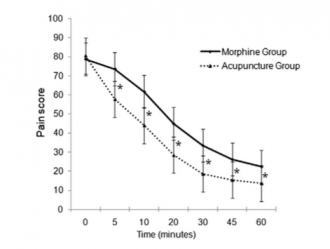 From the 5-minute time point, the acupuncture group reported significantly larger pain decrease compared with the morphine group. This difference persisted during the entire study period. Change of blood pressure, HR, RR, and oxygen saturation was not significant in both groups. A graph from the study showing the pain-decreasing differences between morphine and acupuncture. Since 1996, the World Health Organization has recognized acupuncture as a safe and effective therapy for the treatment of a wide range of conditions, including pain and discomfort.Despite this, the use of acupuncture within the conventional standard of care is still exceedingly rare. A deep skepticism exists for therapeutic modalities that do yet have a clearly characterized mechanism of action, as defined through conventional biomedical understanding and terminology. Often, in lieu of this, its therapeutic effects are written off as merely “placebo”. Placebo, however, is not as diminutive term as it may first seem. The placebo effect actually reflects the deep power and regenerative capability of the body-mind to heal itself. And since its power translates directly into real, measurable improvements in terms of clinical outcomes, it does not matter if we fully understand “how” it works. Also, consider that “evidence-based” (EB) medicine not only depends entirely on clinical outcomes as final proof of an intervention’s efficacy, but also, the entire EB medicine model depends on “controlling” for the placebo effect, as it is already tacitly recognized as having immense power in influencing the outcomes in most interventions. And so, whether or not a fully known or plausible “mechanism of action” has been identified is secondary in importance to whether it works or not in clinical practice. Acupuncture happens to be one of the most extensively supported alternative modalities, with clinical trial data supporting its value in over 100 different conditions. If you do a pubmed.gov search you’ll find over 6,700 published studies related to the keywords “pain” and “acupuncture.” You can view the primary literature we have gathered on the topic at the Acupuncture page on GreenMedInfo.com. Clearly the new study reveals that acupuncture has a powerful role to play in pain management. With addiction to pain relieving drugs affecting millions around the world, acupuncture is perfectly poised to provide patients a time-tested, drug-free alternative. 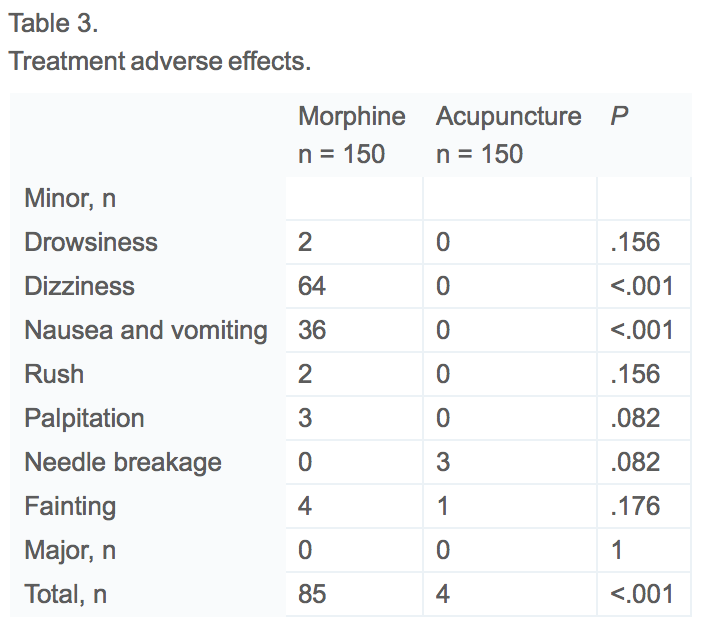 As you can see from the study’s graph (table 3), the adverse effects comparison is staggeringly in favor of acupuncture as the safer modality. 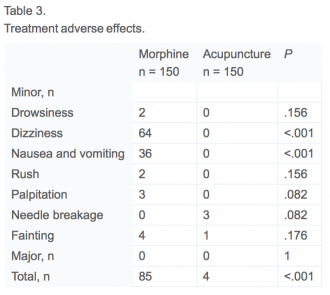 “Our study demonstrated that in patients with acute pain syndromes presenting to the ED, acupuncture is at least as efficacious and has a better safety profile than IV morphine. The results of this study suggest that acupuncture has a potential role in controlling acute pain conditions presenting to EDs and appears to be safe and effective. Future studies should be performed in international populations.